Kermit Ruffins’ Jazz vocal album Happy Talk. Irvin Mayfield’s Jazz album A Love Letter to New Orleans. Rebirth Brass Band’s Roots album Rebirth of New Orleans. 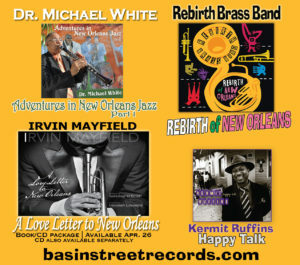 Dr. Michael White’s Jazz album Adventures in New Orleans Jazz, Pt 1. It would be nice and great to include an African Artist, most especially from Liberia (with the first female President); LIB Recording Artist / Musical Ambassador, ***OttoakaSugarVon***. He’s Liberia Prolific Artist, one of the best and Original Artist and Producer at POG Production (Creative Music Lab). Thanks. Please let me know when you plan on returning to the Boston, Ma. area. I would love to work with you once again. Since Catrina I have lost touch with Bill Summers, and hope all is well? How is your baby doing? Great reaching out to you, and Congrats on all your accomplishments! Look forward to hearing from you. Pls. Check out my website, and feel free to sign my guest book.